3:30 - How did the Necrox/BC move help EG’s roster? 6:14 - How do you explain Siege to those who’ve never played it? 11:08 - Can Siege ever get to the level of a CS:GO or LoL? 15:10 Is the Six Invitational 2018 final the greatest Siege series ever played? 19:50 - How do you balance being an IGL with your own play in-game? 31:20 - What are your thoughts on the recent update? 35:15 - What do you think about operators? 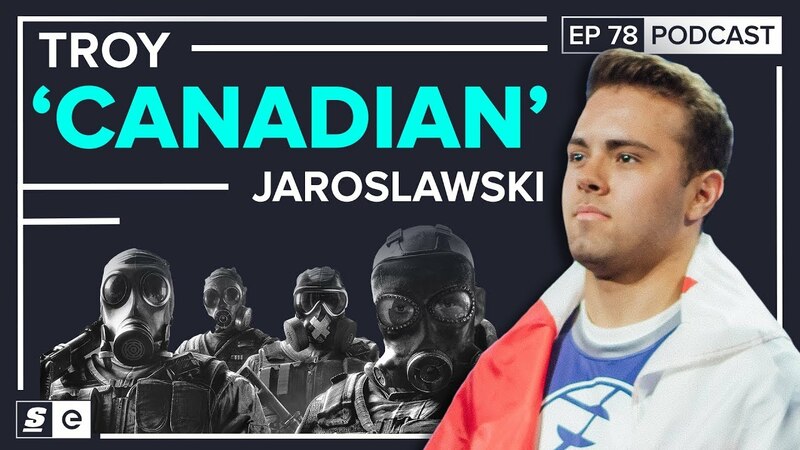 Troy "Canadian" Jaroslawski is a professional Rainbow Six Siege player for Evil Geniuses. He joined theScore esports Podcast to discuss what makes Siege a special kind of shooter, whether it could become the next tier-one esport, and the steps that Ubisoft is taking to ensure that it keeps growing. At first glance, Rainbow Six Siege looks like just another competitive shooter, like CS:GO, Call of Duty and countless games before them. And yet, beneath the surface, it's riddled with the kind of complexity and nuance that people usually associate with MOBAs. When Canadian needs to describe the game to someone who has never played it before, he calls it "the Dota of shooters." "Dota comes off as the most complex [MOBA] to me," Canadian said, "and I do think Siege is the most complex shooter out there." Siege's maps, destruction mechanics and unique Operators, each with special abilities that set them apart, on top of a relatively new pick-ban system, helps set the game apart from other shooters. "There's a lot of depth to it," he said. "And it's not something you're used to seeing in a shooter. It's a bit overwhelming at first, and it definitely makes it a difficult game to get into... For a while you're just dying because you didn't know something existed, basically." In spite of Siege's complexity, Canadian says the game definitely has what it takes to join games like Dota 2, League of Legends and CS:GO in the hallowed halls of tier-one esports. "It's been steadily growing, and Ubisoft is definitely willing and is supporting the game heavily both on the competitive side and just in general" he said. "It's really exciting to watch, even if you don't understand all the intricacies... I think it kind of appeals to both sides, and I really like that "
Canadian is one of the few household names Siege has to offer. Between first place at last year's Six Invitational and second place this year, he's helped see the game off to an explosive start in esports. In fact, this year's Six Invitational Grand Final is already being touted as the greatest series the game has seen. "I'd say [it was] the greatest or one of the greatest series in Siege," Canadian said. "It was the second invitational, and this was when the prize pool really got knocked up... We [and PENTA] had never played before, so it was kind of like a clash of the titans. And, [it was] NA vs. EU, which is always a big deal." After taking a two-game lead in that Grand Finals, Evil Geniuses went on to lose the series 3-2. "We were extremely confident [going into Game 3]," Canadian said. "Obviously, we still had the mindset of like 'Anything can happen, we can't let up.' To be honest, I think I was happier when we went up 2-0 than when I won the first Invitational... so to look back on it kind of sucked." In an effort to bolster the game's popularity — and viability — as an esport, Ubisoft recently implemented a patch that both reworked Siege's shooting mechanics and continued the regular deployment of new operators with Maverick and Clash. "I like that the sight misalignment is gone. I do think some guns' recoils are a bit too easy now but, at the end of the day, I'm okay with it," he said. "I think both [operators] are kind of situational, where like, Maverick, only some sites and some maps can you really get use out of him... but when you do have the chance to use Maverick, it's ridiculous." "Clash is also annoying," he went on to say, "but I think she's kind of an operator that you need to build your setup around." Some operators are more situational than others, however, and Canadian feels that the game would benefit from having more of those whose game-changing kits usually result in their getting 'perma-banned' at tournaments. "I think that there needs to be more and more of them," he said. "That makes the meta more interesting, and the ban phase, you kind of put more into it, you prepare more for a specific team... I think it's better overall if there are more operators like that, and you can't just permanently ban Mira."